Today, I will be sharing two dishes commonly found in Srilankan cuisine: okra curry, which is a white curry, and spicy stir-fried dried sprats. In Sri Lanka, okra (or bandakka as is known locally) is generally prepared in 2 different ways: stir fried (thel daala) and in a white curry (sudata). 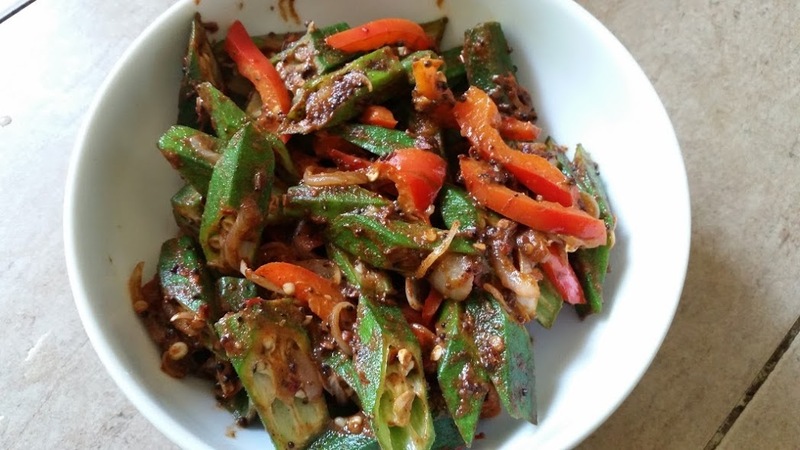 I have shared the recipe for stir fired okra previously (image above) and today I will share the white curry preparation. In a pan, heat 1 tablespoon of oil (vegetable/ sunflower/ olive) and add the curry leaves, onions and green chillies. Toss well, until aromatic and add in the spice powders and okra. Mix well, until combined and add in the water and coconut milk/ cream. Simmer on a medium heat for a few minutes, until the curry has thickened and okra is cooked. The okra should still have some crunch to it, and retain its green colour. This ensures the okra has not lost its nutritional properties. Serve with white rice, meat/ fish of choice and a salad, if desired. 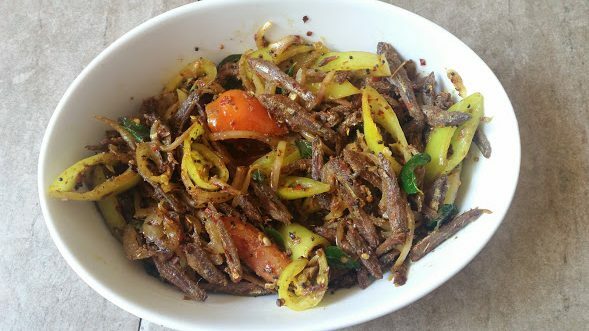 The other recipe for today is stir-fried dried sprats or as we lankans call it halmasso (sprats) thel dala (stir-fried). This tends to be a dry, yet spicy preparation and pairs well in a simple meal, with dhal curry and white rice. Dried sprats (also known as skippers) are considered nutritious across Sri Lanka, with the fish containing high levels of vitamins and minerals. The fish are salted and dried and are available in Asian grocery stores. They are also known as ikan bilis in Malaysian cuisine as well. Before you can use the dried sprats, the heads need to be removed (they come off easily) and washed well in warm water to remove excess salt. Leave aside to drain, while you prepare the rest of the ingredients for this dish. In a pan, heat the oil and fry the curry leaves and spices. Add the onions, tomatoes, capsicums and cleaned sprats. Mix well and cook for about 5-7 minutes, until thoroughly cooked through. Note: dried fish tends to have a slightly distinctive smell. If you’re not fond of slightly smelly, yet delicious fish, this may not be for you. But for those adventurous readers out there, this is a must try!